After the S.H. Figuarts packaging for the Kikaider cast proved to be some of best looking boxes the line has ever produced, it's rather disappointing to see the S.I.C. arrive in such a bland box. Like most Tamashii web exclusives these days it's windowless packaging, with the front featuring a stock image of the figure (the one probably used the most during its promotion) against a red background with various computer readouts and the S.I.C. logo. The back has another two images against a solid backdrop, while the spines have "Kikaider" written across them. So while it isn't an entirely awful packaging design, it is pretty uninspiring when compared to some of the other things Tamashii Nations have pulled off elsewhere. S.I.C. redesigns are usually hit or miss among the tokusatsu fandom. Sometimes Bandai really manage to nail a "grittier" version of a character, while others arguably miss the mark. Then sometimes you get the ones that barely look any different from their show counterparts, leading you to wonder why they even bothered in the first place. Kikaider is a character that's never really suffered from this issue. Each version throughout the years has managed to capture the essence of the character. This new 2015 iteration is no different, emphasising his purely robotic nature. 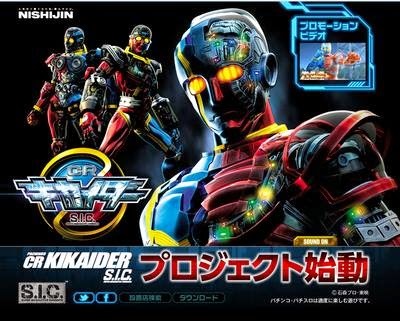 Unlike the original version (and to some extent, the REBOOT design) this Kikaider doesn't look at all like a costume, blending muscular detailing with obvious metal plating. The colours have also received an upgrade - reimagined with immaculate red and blue metallic paint with gold trim wrapping around parts of the body. All of the silver sections that adorned the red side of the original body are now done in the same style as the exposed brain section - silver mechanical detailing embedded under clear plastic windows. There isn't a single piece of this figure that doesn't have some sort of sculpting or detailing, making it truly a sight to behold. As a fellow Tamashii Nations product, there is also the similar level of excellent articulation that collectors would find in the S.H. Figuarts line too. Kikaider comes loaded with a ball jointed head, neck, shoulders, wrists and hips along with hinged elbows, knees (both double hinges) and ankles. Rounding things off is another ball-joint separating the chest just before the abdomen. There are also bicep swivels and a diagonal cut at the top of the legs which provide the same sort of movement - handy as unfortunately the one thing the S.I.C. lacks that the Figuarts has is the "swing-down" hip engineering. This means that while this Kikaider is still capable of pulling off some pretty great poses, it isn't quite as nimble as its show accurate cousin. Both shoulder pads are also connected via small hinge allowing them to move upwards and downwards along with the arm when posing. While pretty sturdy, in the event those should pop off they will simple click back on with minimal pressure. The accessory count is another area where S.I.C. Kikaider far outclasses the S.H. Figuarts version, as it is another area where the "Imaginative" part of the name can be properly realised. Kikaider comes with an additional four pairs of hands - one of which are especially cool as they are moulded in translucent yellow plastic to simulate a power-up effect. These are to go with the two big accessories the figure comes with, which are giant blue and red energy effects representing the character's "Denji End" finishing attack. To connect these pieces to the arms, first you must remove both any hands connected as well as the two cuff pieces sitting just above the balljoints. The pieces then slide over the arms in their place, exposing the balljoints for another pair of hands to be attached (be it the translucent pair or otherwise). The blue energy effect also has a piece that can be removed from it, allowing the two to be attached in a cross shape just like the attack itself. Since back in 1972 there wasn't much in the way of special effects to make the Denji End look truly spectacular, it's really great to see it fully realised on a toy in this way. The effect parts are absolutely gorgeous - the two-colour translucent plastic looks fantastic and both pieces are suitably thick and sturdy. They look so damn good that it makes up for the fact this is yet another Kikaider that doesn't come with his signature red acoustic guitar - an oversight more unforgivable on a S.I.C. because previous Kikaiders in the line have come with one! Android Kikaider was the series that first breathed life into the S.I.C. line, and it's my sincere hope that this new Kikaider figure will signal a whole new range of modern interpretations of its cast. As great as the old ones look, articulation has come a long way since then and many of them now fetch a pretty high price on the aftermarket. With a new Hakaider following February next year and the Pachinko machine showing off some pretty nifty redesigns of Kikaiders 00 and 01, the potential is most definitely there. But back to this figure itself - it is utterly spectacular. An incredible sculpt, impressive articulation and beautiful accessory pieces - it's the perfect package that any Kikaider fan should have in their collection. Even if you're an S.H. Figuarts fan with a desire for show accuracy and a relatively consistent scale, consider picking this figure up and I'm certain you won't be disappointed with it.